Though you’d think the majority of the iPhone’s lengthy creation process would have been uncovered by now, that isn’t the case. The Verge recently got its hands on an original iPhone prototype board used for what is commonly referred to as an ‘engineering validation test’ (EVT). The ‘M68’ board dates back to 2006-2007, the time period when the first iPhone was in production and then eventually released. On the board itself, the iPhone’s parts are laid out in a way that’s very similar to a standard PC motherboard, allowing faulty components to be replaced or swapped out. 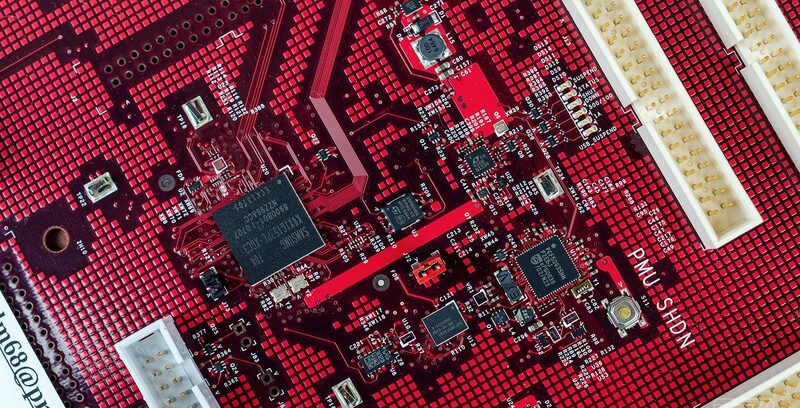 The red M68 board also features a variety of connectors for testing the prototype iPhone’s various features. According to The Verge, the sample iPhone board includes a display, giving the engineer using it an idea of what the final version of the phone will look like. That said, there were also reportedly other versions of the EVT board that didn’t include a display in order to better keep the project under wraps. The EVT board is a fascinating look at one of the most influential tech devices to release in the last two decades. It’s also a reminder that Apple managed to squeeze an entire computer in a device the size of a phone. This is the first time a prototype iPhone board has been photographed publically. The board made it into The Verge’s hands courtesy of an anonymous source that goes by ‘Red M Sixity’ (@theredm68). For more information on the M68 board as well as a gallery of pictures, check out The Verge’s story about the historic hardware.